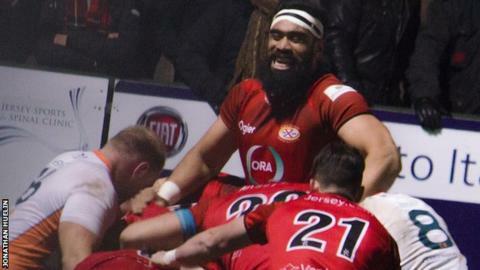 Tonga international number eight Uili Kolo'ofa'i has signed a new contract with Jersey for next season, along with three other players. The 33-year-old joined the Championship side in October and has missed just one game since for the Channel Islanders. Simon Kerrod, Fautua Otto and prop Sean McCarthy have also penned new deals. "Uili has been increasingly influential since his arrival and I believe he'll be an important member of next season's squad," said head coach Harvey Biljon. Jersey currently sit fifth in the second tier and now have 18 players signed on for next season.